This versatile end table was crafted to coordinate seamlessly into outdoor wicker furniture arrangements. The table features a woven top with a smooth, chic lay-on glass surface. 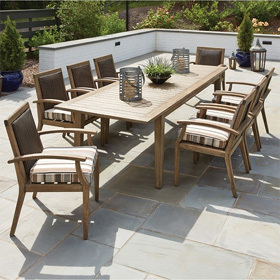 Additionally, this outdoor accessory's durable aluminum base provides a stylish contrast-look aesthetic while ensuring that the table will be around for seasons to come. 20"L x 20"W x 23q"H 13 lbs.